It’s officially Christmas jumper season, and Lorraine has wowed fans with her latest fashion find. A far cry from typically garish Christmas jumpers, Lorraine’s festive choice was a sparkly, yet sophisticated, black number for a recent episode of her talk show, showing that an all-black outfit needn’t be boring. With a high neck and a close fit, the jumper looked incredibly flattering on her toned figure, and its metallic fabric added just the right amount of sparkle for a tasteful Christmas look. 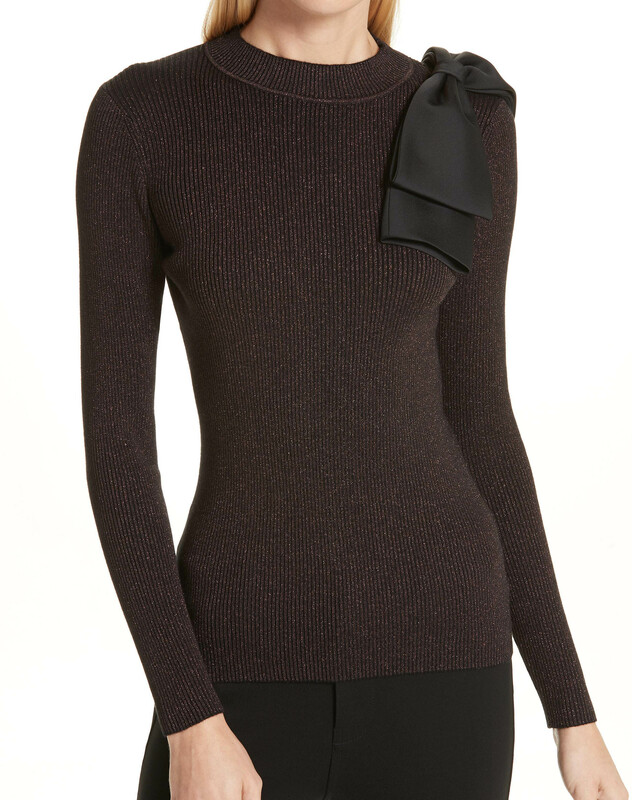 The Lizziia double bow jumper is by high-street retailer Ted Baker, priced at £109, and is available from John Lewis. Although the jumper can be worn with just about any bright skirt or trouser, we’re big fans of Lorraine’s choice of black close-fitting trousers from Oasis and metallic heel from Dune. Ever the savvy shopper, Lorraine kept her jewellery to a minimum to let the bow detail take centre stage, but made her ensemble extra-Christmassy with her choice of bright red nail polish. We reckon the jumper would look stunning with any choice of make-up – why not try sparkly nail polish for an even more festive look? This jumper provides the perfect balance of fun and fashionable, and offers a sparkly alternative to the usual cheesy Christmas jumpers on sale, ideal for any festive fashion naysayers. And who says the jumper is just for Christmas? As there are no overt yuletide prints or extras (flashing reindeer nose, anyone? ), this jumper can be worn for any occasion, including your big New Year’s event. Gift yourself this Christmas with the bow-detailed sparkly Lizziia jumper. Although it is a little pricey, it’ll last you through the seasons and look good alongside a lot of your wardrobe. It is currently available online in sizes XS-L, but we anticipate it won’t be around for much longer!